VIETNAM - At the end of October and according to the General Statistics Office, Vietnam had about 3.0 to 4.0 per cent more pigs on farm as compared to last year at this time (farmers are beginning to expand the herd, preparing for the Lunar New Year in mid-February), write Ron Lane and Meggie Vo. Currently in Vietnam, livestock conditions are favourable as diseases are not a large problem and the pork production is a relatively well developed market with stable demand and reasonable profits. With the signing of TPP, many larger farms are looking at restructuring towards further integration. The total projected number of pigs for 2015 is approximately 27.2 million pigs (on-farm) and approximately 3.923 million sows. Total meat output will be 4.782 million tonnes of which pork will be 3.449 million tonnes (around 72 per cent of total meat is pork). For 2016, it is estimated that 27.5 million pigs with 3.905 million sows (marginal increase in pigs with marginal decrease in sows) will be on the farms. Total meat production will reach 5.009 million tonnes of which pork will be 3.603 million tonnes (still pork continues to be around 72 per cent of the total meat supply). Recently, pork prices in the southern provinces tended to rise slightly as the supply sold by local pork producers was lower than before. The demand for pork in the marketplace remains high. In the Dong Nai region (near Ho Chi Minh), the market pig price increased approximately 1,000 VND/kg ($ 0.045 USD/kg-$ 0.02 USD/lb.) 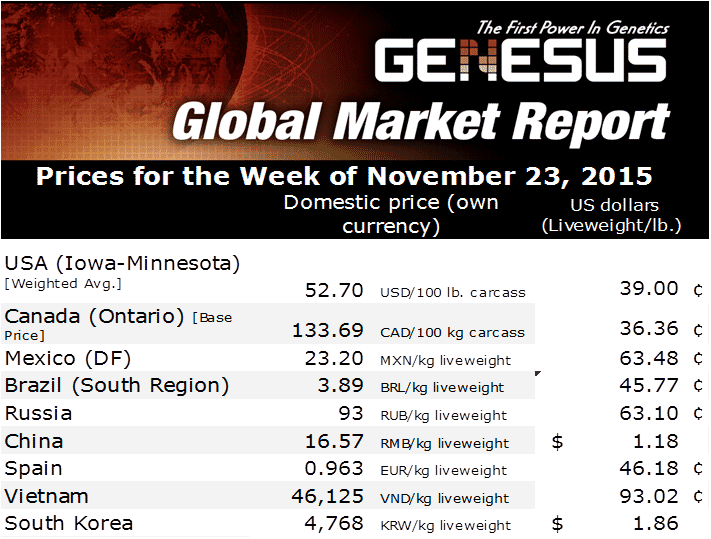 to around 44,000 VND/kg ($1.99USD/kg-$ 0.90USD/lb.) and in the Southern region to the level corresponding to 43,000 VND/kg to 45,500 VND/kg ($ 1.945 to $ 2.06USD/kg-$ 0.88 to $ 0.93USD/lb). The price in the northern region ranged from 46,000 to 49,000 VND/kg ($ 2.08 to $ 2.22USD/kg-$ 0.94 to $ 1.01USD/lb.). The import value of commodity groups and animal feed ingredients for the month of October is estimated at $ 258 million USD, bringing the value of imports for the first 10 months of 2015 at $ 2.81 billion USD- up 2.8 per cent over the same period in 2014. For this year, the major importers of the various commodity group/feed ingredients are Argentina (42.2 per cent market share); the USA (13.5 per cent), Brazil (9.1 per cent) and China (5.6 per cent). The estimated corn import volume in October reached 584 thousand tonnes with a value of $ 119 million USD, bringing the volume of imported corn in the first 10 months of 2015 to 5.72 million tonnes with an import value reaching $ 1.26 billion USD-up 55.8 per cent in volume and up 32.8 per cent in value over the same period of 2014. Brazil and Argentina are the two main suppliers accounting for 53.4 per cent and 41.8 per cent respectively, of the total import volume of commodities. Global processed meat was valued at 529.3 billion USD in 2014 and is forecasted to reach over 1.22 trillion USD by 2022. The main factors that will drive the market growth is more disposable income, a young population and good salaries-certainly all found in Asia Pacific and especially in Vietnam. The general increase in food services and trade in the region has improved the overall supply and availability. In early September, about 300 Vietnamese pig-breeding households in Dong Nai province signed a commitment not to use banned chemical substances that promote lean meat growth (lean-meat agents were banned in Vietnam in 2002 and include salbutamol, clenbuterol and ractopamine (paylean). This came as a result of a recent inspection by the HCM Veterinary Medicine Bureau of urine samples at the slaughter houses. During the past while, random samples have been taken at pig production units in the province, with 17 of 84 samples showing positive for salbutamol. However, when police launched a more thorough investigation, they found more farms in a broader area with tainted feed and pork. In Tien Giang, 32 out of 50 samples taken from 12 large farms had banned substances. In DongNai, 3 out of 6 newly tested farms were using large quantities of the banned drugs. (DongNai has about 1.5 million pigs on-farm). From this, The Ministry of Agriculture and Rural Development (MARD) has been strongly pushing a food safety and hygiene campaign directed at swine farms prior to the TET holiday. The main emphasis is on stopping the use of banned substances for growing and finishing pigs (about 7.6 per cent of the meat samples contained antibiotic levels that were higher than the recommended allowances). In Ho Chi Minh, VISSAN, De Heus Ltd. and Fresh Studio Innovations Asia (DHFS - Safe Pork) signed a memorandum establishing the pork value safety chain. According to Gabor Fluit, CEO De Heus, and Fresh Studio Innovations Asia, they will organize training for approximately 200 pig farmers, first in the DongNai region on the safe use of seeds, feed and to apply technology. From this, about 50 farmers will participate in the value chain. The Dutch government will support a portion of the capital and will provide the technical consultants. The farmers are to maximize the ability to establish a safe supply chain from breeding through to slaughter and to the finished products along with distribution to the market-complete compliance to the standards of TRACEPIG. One of the challenges with the signing of the TPP, is that the livestock industry has a very low ability to compete with other nations. Van Duc Muoi, who is the General Director of VISSAN, mentions that about 85 per cent of the livestock farms are small sized leaving only 15 per cent are large scale farms. Vietnam has the world’s 3rd largest number of sows, but only ranks 15th/16th in pork output. Low productivity leads to higher pork prices compared to other countries. “The deal will force the livestock industry to change and fix its weaknesses, otherwise it will not survive”, said Mr. Muoi.